For the most part, Noordam serves up fresh, tasty and varied fare. A Culinary Council made up of five high-profile chefs, along with Holland America's master chef, Rudi Sodamin, contribute recipes that are featured most nights in the main dining rooms. Vegetarian options and at least one sugar-free dessert are included on dining-room menus. Still hungry? Late-night snacks are served until 11:30 p.m., and pasta and pizza are dished out until midnight in the Lido Restaurant. Plus, sandwiches and pastries (free with the purchase of specialty coffees and teas and bottled water) are in the Explorations Cafe from early morning until 9.30 p.m. Two other eateries and the ship's weekly pop-up restaurant, Le Cirque, present even more options for those willing to pay extra for variety. Vista Dining Room (Decks 2 and 3, aft): The pleasant main dining rooms are connected by a grand staircase and decorated in dusty rose hues. Large windows surrounding the room bring the outside in. Breakfast consists of made-to-order eggs and waffles, plus the usual cereals and baked goods. Lunch is available on port days with a selection of starters, mains and desserts. Sample entrees might include stuffed bell pepper, salmon piccata and Swiss steak. A daily "express combo" option caters to those in a hurry. Afternoon tea is a HAL tradition. It's served in the upper dining room daily from 3 p.m. to 4 p.m. and is so bountiful it could qualify as a meal. Three themed teas -- Indonesian, Royal Dutch and Cupcake -- are served once during each sailing. Afternoon tea on the Noordam is deservedly popular and can feel somewhat chaotic at times. Arrive early to secure one of the better tables and order your drinks promptly to beat the rush. A table is also reserved for solo travelers to meet and enjoy tea together. Fixed seatings for dinner are at 5:30 p.m. and 7:45 p.m. HAL's "As You Wish" dining allows open seating (with or without a reservation), with the last seating at 9 p.m. Buzzers are handed out to As You Wish diners at peak times so they can enjoy a drink in the bar while they wait. Signature dishes available nightly include French onion soup, Caesar salad, grilled salmon, broiled strip loin and roasted chicken. Plus there's at least one vegetarian entree on the menu nightly. A full vegetarian menu, including vegan selections, is also available but should be ordered the night before. A typical dinner menu has six to nine appetizer/soup/salad selections, such as deep-fried hazelnut crusted brie and salmon tartare with baby zucchini; eight to 11 entrees, such as bucatini with duck and rockfish with garlicky clams; and 10 or so dessert options, such as caramelized pear crepes with vanilla ice cream and sugar-free hazelnut mousse cake. Wine recommendations are on the menu nightly and include vintages starting at US$5.50 a glass. Explorations Cafe (Deck 3, midship): Occupying a corner of the ship's popular library/computer lounge, the cafe serves complimentary pastries, sandwiches and mini-bagels with the purchase of specialty coffee drinks and Tazo teas. Coffee-loving Australians might be less than impressed with the push-button machine, but staff members froth the milk manually and turn out coffee that is better than expected. Open daily from early until late. Lido Restaurant (Deck 9, midship): The casual-dining buffet restaurant can get hectic during breakfast and lunch, particularly on sea days. Be patient if you want a window seat, and avoid tables near the serving counters. Breakfast includes made-to-order eggs (seven varieties! ), omelettes, waffles, mounds of fruit, cheese and about every other breakfast food imaginable. Lunch features several hot entrees, sushi, plus an Asian and Indian station with spicy noodle dishes and stir-fries. Lunch finishes quite early, at 2 p.m. The dessert bar has pastries and hand-scooped ice cream. Deli fare, including pre-made sandwiches, is available from 11:30 a.m. to 5 p.m. The pizza/pasta bar operates from 11:30 a.m. to midnight, so there is little chance of going hungry, even when other sections of the Lido are closed. A casual dinner with waiter service, from 6 p.m. to 8 p.m., incorporates a couple of entrees from the dining-room menu and other options, along with multiple appetizers, soups, salads and desserts. Dive-In at the Terrace Grill (Deck 9, midship): Big, delicious, made-to-order burgers (including vegetarian) and what must be the best fries on the high seas (crispy on the outside, pillowy on the inside and worth every calorie) are served at a walk-up window by the Lido Pool. Adjacent is a serve-yourself taco/nachos/burrito bar. Open 11:30 a.m. to 5 p.m.
Room Service: Free room service is available round the clock. Super-early risers can get a full breakfast delivered before the Lido Restaurant opens (order by 2 a.m.). From noon to 10 p.m., you can get salmon, salads, French onion soup and sandwiches, among other fare. Items are more limited during the wee hours. 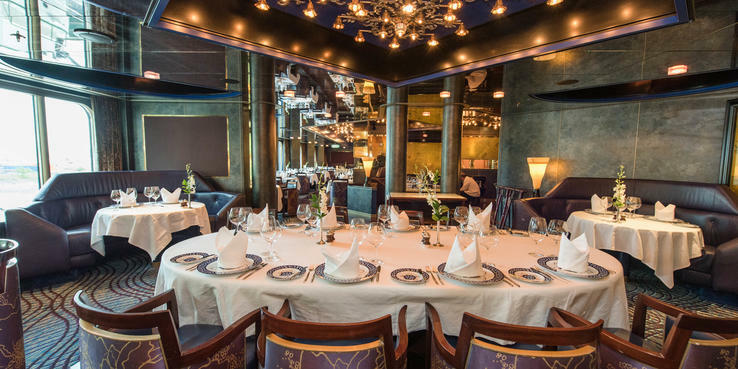 Two fee restaurants, Canaletto and the Pinnacle Grill, plus Le Cirque, a pop-up eatery offered once per cruise in the Pinnacle Grill, are available to diners who crave something beyond the ship's standard dining. Pinnacle Grill (Deck 2, midship); US$10 for lunch, US$35 for dinner: Pinnacle Grill, the ship's special-occasion eatery focuses on Northwest-inspired dishes served in a small, elegant space. Appetizers, such as the Dungeness crab cakes, are wonderful. Fellow diners raved about the Washington-raised beef and the filet mignon topped with a lobster tail. Vegetarians can order from the sides menu, which includes grilled asparagus, wilted spinach and sauteed mushrooms. Le Cirque at the Pinnacle Grill (Deck 2, midship); US$49 per person; US$89 with wine pairings: This once-per-cruise pop-up restaurant features menu items from its renowned New York namesake. Expect fresh takes on classic dishes, such as rack of lamb, sea bass and chateaubriand. Recommended starts and finishes to this feast: Le Cirque's signature lobster salad and creme brulee. Dinner only. Reservations are recommended. Canaletto (Deck 9, midship); US$15: A section of the Lido Restaurant goes Italian from 5:30 p.m. to 9:30 p.m. nightly, serving what we thought was some of the tastiest food onboard. Relaxed, friendly service and a large number of window tables made this one of our favorite spots to dine. A word of caution: When they say plates are meant to be shared, they mean it. Portions are huge. We particularly enjoyed the seafood soup and eggplant stuffed with ricotta as appetizers, the shrimp ravioli and the potato gnocchi with braised beef short ribs. The grilled sea bass also earned rave reviews on a recent Alaska cruise. Canaletto books out quickly during most cruises, so get in early if you would like to eat here, especially if you have a preferred dining time.